Japan is a country like no other. Situated in Eastern Asia, it is a land of beauty, mystery, culture and more. Home to well over three hundred plus million people, it is a country very distinct from the rest. Dating back eons, it is one of the most unique countries in all of Asia. Given Japan’s unique position in the world, it’s no surprise that there is a great deal of fascination with Japan among foreigners. Whether it is Japanese anime, the food or its cultural elements, to include some of the Japanese’s finest elements into one’s lifestyle has become a trend unto itself. One such trend that is fast emerging is that of Japanese indoor décor, particularly the ones used in traditional Japanese societies. What is a Traditional Japanese Bedroom? To start off, let’s take a look at the traditional Japanese bedroom. In other words, what would you find if you were to enter a traditional Japanese bedroom in Japan? Is it any different from the average western bedroom? Or is something very different? As far as function goes, they are fairly the same as any other bedroom. They cater to everyday activities such as sitting, sleeping and so on, in the same way, it would be anywhere else. The real difference lies in the layouts, furniture, and overall ambiance. It is this, which distinguishes the average Japanese bedroom from the rest. But the most important element of all happens to revolve around one single concept; Minimalism. In other words, the Japanese do not go in for heavy arrangements or décor. On the contrary, everything revolves around minimalist principles, where the focus is on functionality and simplicity. Anything considered as ‘excess’ is eliminated at the earliest. While the Japanese don’t necessarily use the term minimalism, it is essentially the principle they have embraced and it shows in their simplistic, clean and tranquil home decoration. Given that this is the case, it is important to understand the traditional Japanese design context of Minimalism, in comparison to the contemporary one found in the west. A good place to start is this essential reading by the enlightened author Fumio Sasaki called Goodbye, Things: The New Japanese Minimalism. Western minimalism is largely focused on the material aspect of society, given the consumerist nature of Westerners. It is in a way a kind of rebellion against the consumerist lifestyles prevalent in western countries. In simple words, it is directed largely towards material aspects of life. 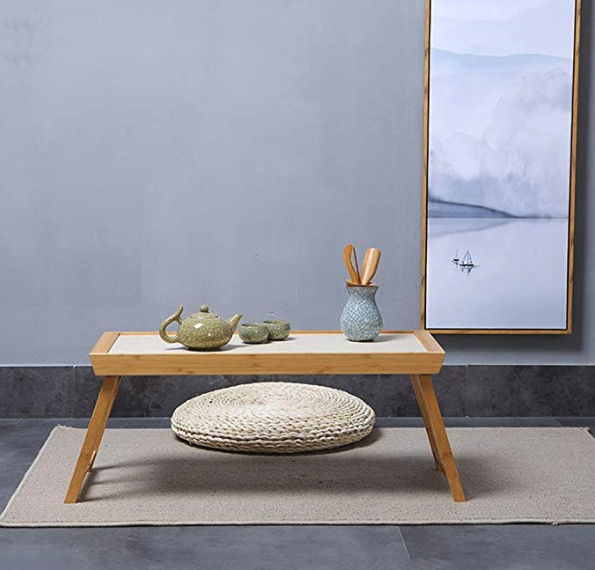 The Japanese form of minimalism, on the other hand, is something that extends to all aspect of décor, ranging from furnishings and other material decors to the subtle elements like decorations, lighting, sound, etc. In other words, Traditional Japanese minimalism exists along the lines of creating ambiance in every single way possible, and not just related to consumerist lifestyles. There are several things that need to be taken into account when designing a Japanese style bedroom. Given that the focus of the Japanese is on minimalism, where exactly is one to begin? Just like in the case of the decorations, the same is true for furnishings as well. One will notice that there is a distinct lack of heavy furnishing in the traditional Japanese bedroom. In its place, what is found is a functionality-focused bedroom, where the amount of furnishing is reduced to the bare minimum. Details about bedding are given in a separate section. The other kinds of Japanese furniture used for the purpose are given below. One minimal and very unique quality about traditional Japanese furniture is that they are very low to the floor. Although this practice of nearly sitting on the floor may be very foreign for people many Westerners, sitting on the floor is a traditional custom in Japan for thousands of years and a respectful tradition in the high aristocracy period of Japan. Like chairs, the tables used in traditional Japanese bedrooms are very low to the floor as well. This is something true for all tables regardless of how they are used; general purpose, tea, dinner, works, etc. 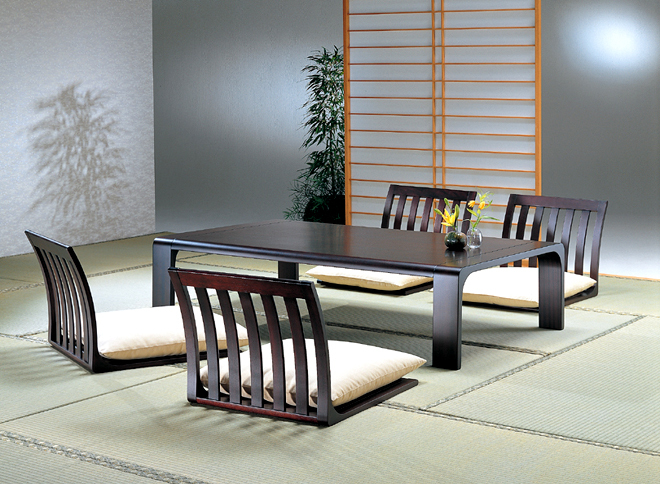 Called Chabudai by the Japanese, they also called Japanese floor tables are very common in most places across Japan. Also to note here is that these tables are largely restricted to the warmer times of the year. Once the winter arrives, they are usually replaced by another kind of table called the Kotatsu, which is essentially a short table with a heater underneath. The table comes with a removable top, which can be lifted to place the heating element or any other source of warmth. 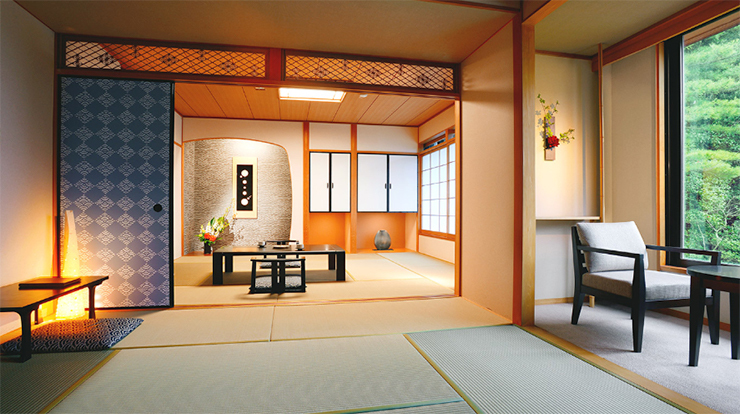 The traditional Japanese design for a room doesn’t involve heavy decorations. Extensive use of decorations is generally looked down upon and avoided as much as possible. As with the other elements of a Japanese room, the paintings happen to be minimalist as well. Traditional Japanese paintings are very distinct in their quality because of the emphasis they place on minimalism. The focus of the artist is entirely on the core elements, with almost everything in the background either eliminated or greatly reduced. Some of the classic examples of such paintings include that of individual birds, bamboo, Japanese symbols or ‘Kanji’, etc. They may also feature small verses of Japanese poetry known as ‘Haiku’. One thing interesting is the same styles of painting used to hang on the walls, are often found on the Japanese floor sleeping mat, and other such items. 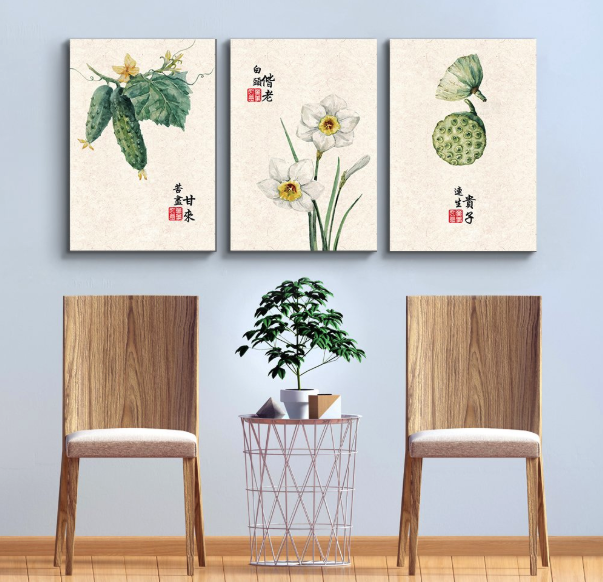 For a deeper dive into decorating your home with beautiful and abstract Japanese paintings, read Modern & Traditional Japanese Paintings To Decorate A Home. In other words, paintings that are depicting everything in it, from the subject to the background, are to be avoided. Good examples of these include the landscape artworks and European styles of paintings that are generally hung on walls as decorations. In a modern Japanese home, the inclusion of bamboo mats is a great way to introduce a simple and elegant addition to any room. Bamboo rugs provide a clean and natural feel to any room. Whether it’s an office space, a bedroom or kitchen, or a small cozy apartment, bamboo makes a wonderful addition in a home by providing the elegance, natural beauty, and comfort. Bamboo is tough in strength and smooth to the touch. Provide your living room with a bamboo rug to create a natural and minimalist look. Bamboo is traditionally used indoors as well as outdoors in traditional Japanese homes. When it comes to indoor bamboos, they usually tend to be small plants, which can fit easily in the corner of the room. It should be noted that all forms of bamboo are not suited for these purposes. There are a few species of bamboo that are smaller in size compared to others, even when they grow up. 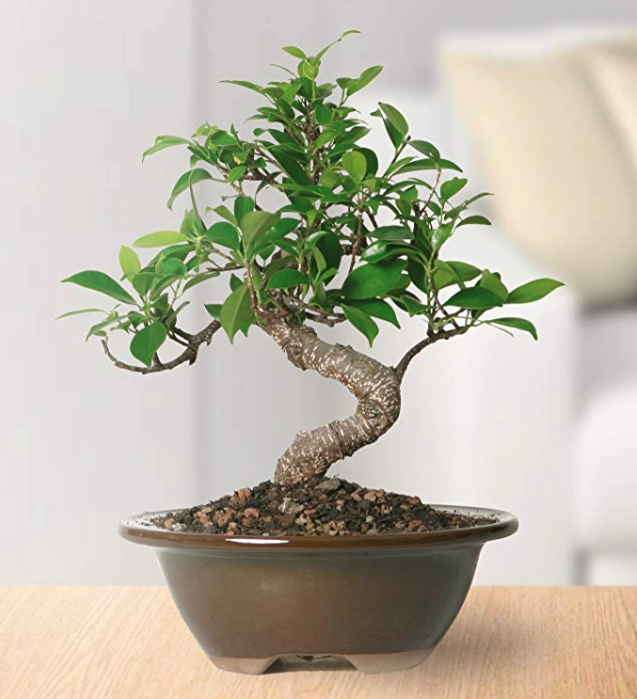 A bonsai is a traditional form of Japanese art and science, used for the creation of small trees that can be placed in a small pot or vessel. The art allows for one to scale down whole trees to a very small size, permitting them to be brought indoors. Bonsai has been successfully used to ‘minimize’ the size of almost all known trees, creating some of the most aesthetic and appealing miniature trees possible. One of the things very distinct and unique about Japanese bedrooms is their use of screens. While the use of screens has been a common practice almost everywhere privacy is needed, nowhere is it as common as Japan. Given that Japan is a country where the people place great emphasis on the concept of privacy, screens can be found everywhere. This is especially true when you talk about traditional Japanese homes. The most common types of Japanese screen dividers are shoji and byobu screens. 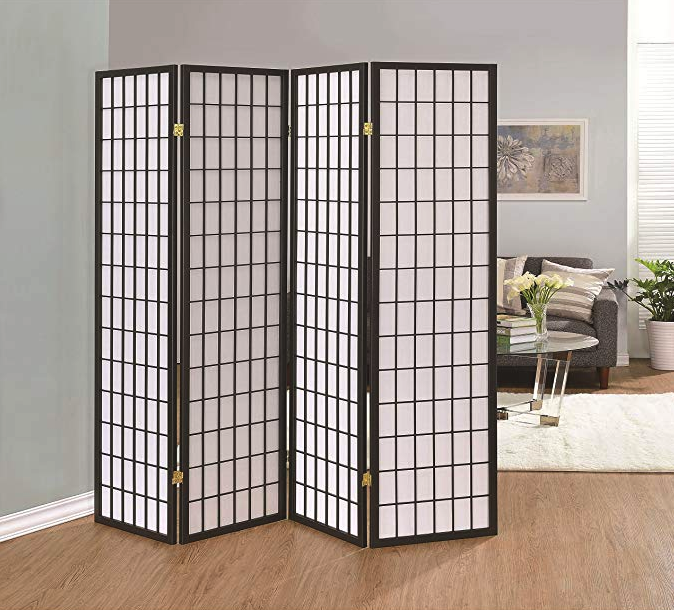 Byobu are folding screens used in traditional Japanese homes, for the purpose of creating separations in rooms or creating a sense of privacy. The screens are usually decorated with art, Kanji or other forms of calligraphy, and can be found almost everywhere in Japan. The most common materials used for the frame of the screens are a different kind of wood. The screens, on the other hand, can be made from other materials like bamboo, paper, etc. This makes them particularly sensitive to rough handling, as a little bit of pressure on the screen is enough to cause damage to them. Shoji is a term used to describe doors, windows and other room dividers in traditional Japanese architecture. They are fairly common almost everywhere in Japan, including urban areas. The popular Japanese ‘sliding doors’ happen to be a form of Shoji. 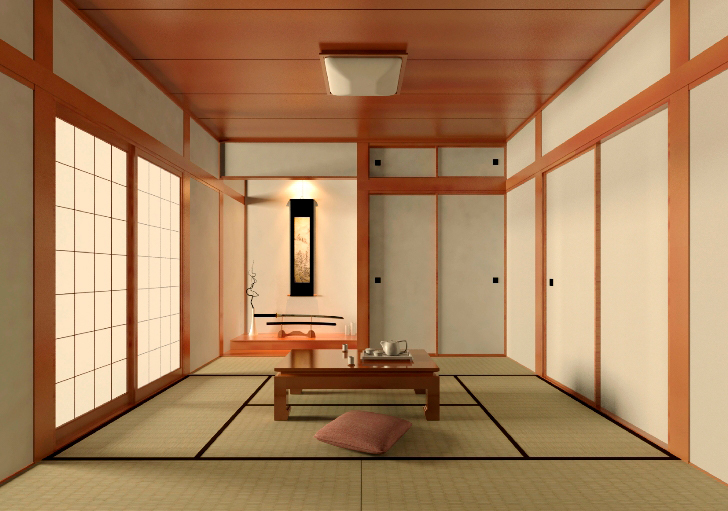 The shoji sliding doors or other such decor is used almost everywhere, whether inside or out. As is the case with Byobu, there is minimal use of art or calligraphy to decorate the screens. They are certainly used, but it isn’t as extensive as it would be in a western country. It should be added that screens need not always be delicate and fragile. On the contrary, there are many screens that are built with toughness in mind, even if they use traditional materials. Regardless, it is important that they are handled with care since even the more durable of screens are essentially just flat layers of material that are at most a few millimeters thick. 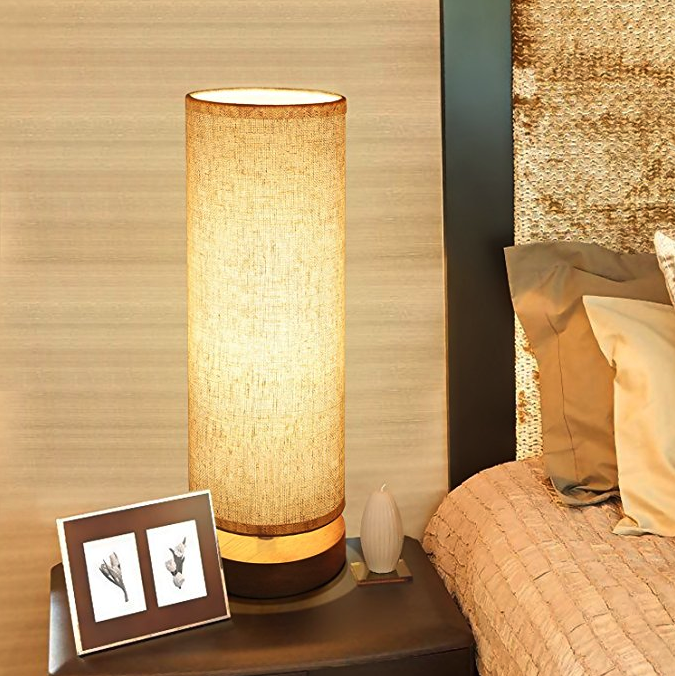 The ambiance is an essential principle in a traditional Japanese bedroom. There is a special emphasis placed on the general ambiance and environment of the traditional Japanese bedroom. 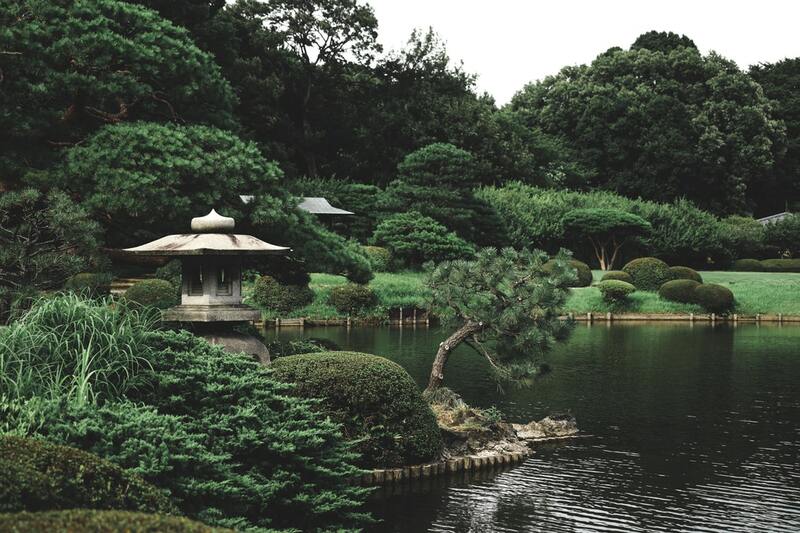 Traditional Japanese homes put a lot of emphasis on upholding the core principle of tranquil and zen. Minimal, simple earthy color tones and vibrant greenery create a settle and beautiful contrast of colors. When it comes to sound, the focus is largely on the principle of tranquility. Sounds and audio perception are usually accompanied by the tranquil and calm sounds of nature. Lush, green trees and plants are greeted by the wind to create a relaxing and vibrant sound. Traditional Japanese bedrooms are expected to be places of peace and quiet. In simple words, they are to have a serene and tranquil environment at all times. Another central concept to the Japanese bedroom is the lighting. Traditional Japanese bedrooms were lit by lamps and other sources of light. This was largely out of necessity rather than choice, given that electricity hadn’t been invented yet. But with the passage of time, this form of lighting became standard practice in traditional Japanese homes. Even today, one can find similar forms of lighting in Japanese houses, albeit powered by electricity rather than lamps. The scent is one of the lesser-known aspects of traditional Japanese homes. However, it does have a place in the ambiance of traditional Japanese homes. The Japanese people put in a great deal of emphasis on aromas in homes, with the source of it being traced back to natural sources. The most common source of scents tends to be that of incense. Another important element used happens to be that of the colors. Extremely gaudy colors are generally avoided in favor of ‘earthy’ colors. Color tones are usually kept to a minimum. Earthy, dark tones are used in favor of flashy, vibrant colors at times. Sleep is a common human need. It is something we all do at the end of the day. In the case of the Japanese, there is a very unique style of bedroom decoration that is found almost nowhere else in the world. This is, of course, changing, as people start to embrace many if not all of the elements found used by the traditional Japanese. When it comes to Japanese bedding, there happens to be a distinct style to it. Traditional Japanese bedrooms tend to come with very strict restrictions on the kind of bedding to be allowed. The core guidelines for these are based on the principles of simplicity, elegance, and comfort. The Japanese futon is a traditional Japanese mat laid directly on the floor. It is also known as a Shikibuton and is the most common form of bedding found in traditional Japanese bedrooms. Unlike western bedrooms, the Japanese do not traditionally sleep on beds. Instead, they sleep on the traditional Japanese mattresses placed on the floor, or furniture that gives a short clearance from the ground. The beds give a few inches of clearance from the ground and are considered as a standard norm in Japanese society. The Japanese people use a pillow known as a Takamakura. Part of the larger Geisha culture, it is used for the purpose of both rest and comfort. The main purpose of it, however, is to provide for the preservation of an elaborate hairstyle. Japanese pillows come in all shapes, sizes, and materials. Typically, buckwheat is used as the core of the pillow, creating a firm comfort that aligns your neck properly with your spine. 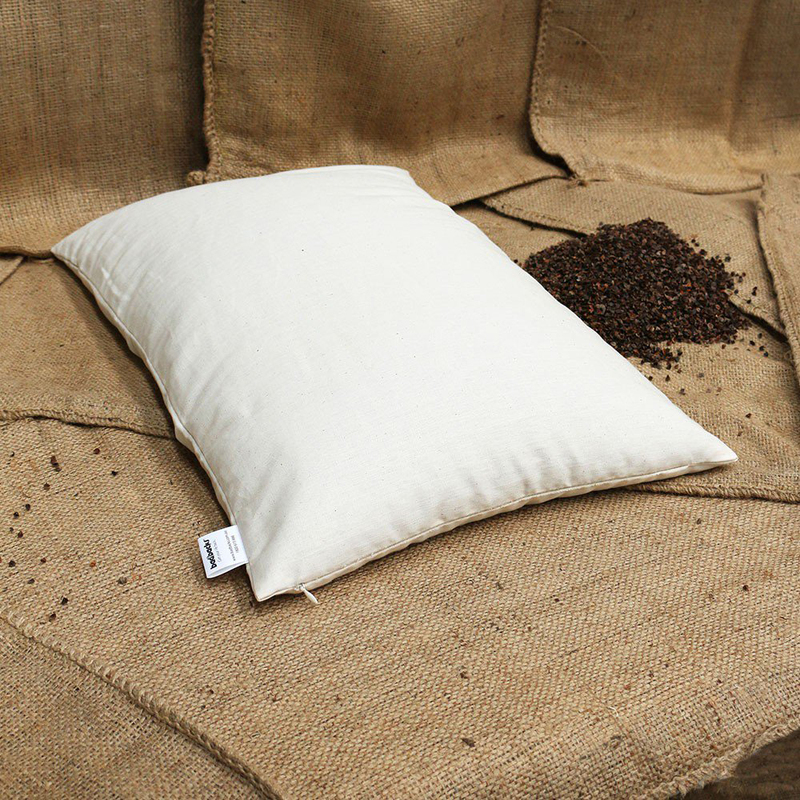 Another essential quality of the Japanese pillow is their natural cooling ability to stay nice, dry and cool. To learn more about buying a pillow made in Japan, check out the 5 Best Japanese Futon Pillows – 100% Natural And Cooling. 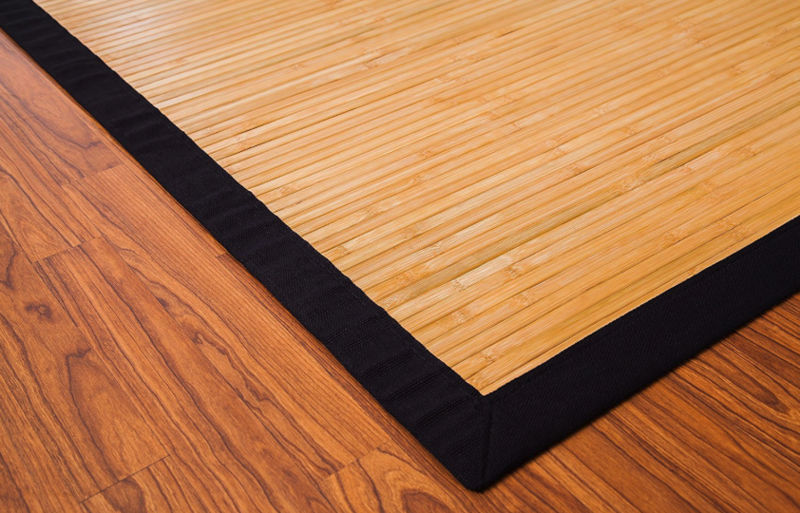 The Tatami is a form of traditional Japanese mat and used in most Japanese homes. Traditionally, it is designed using rice stray for the core, although the use of wood chips and polystyrene foam has become popular of late. The core of the mat is covered by weaving a soft rush straw, called Igusa. The mats are manufactured in a standardized size, with the length being exactly twice the breadth. In other words, they come with a fixed aspect ratio of 2:1. Also common among Tatami mats is brocade on the long sides, called a Heri. This is however not always the case, since some of the Tatami may not come with a brocade. To learn more about tatami mats and where how to buy the right one for your bedroom and home, check out this guide on The Tatami Mat – What You Should Know Before Buying One. Like mentioned earlier, the Japanese usually sleep on mattresses placed on the floor or short beds. Should a traditional Japanese bed be used, the one thing that stands out is their unique design. They are very distinct from other kinds of beds, given that they tend to have minimalist designs, with a focus on simplicity and elegance. They are generally designed to be low to the ground and made to occupy as little floor space as they can. Also to note here is that the beds have very simple headboards, with the side rails and foot rails being rather short. 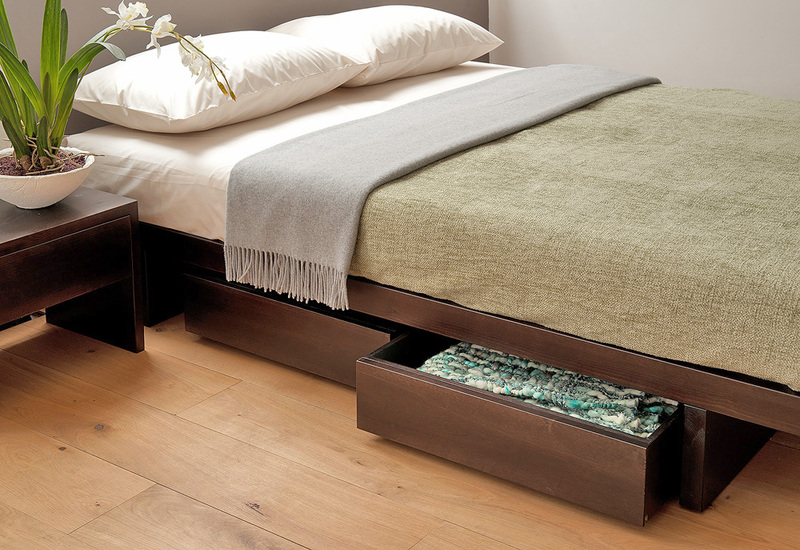 Platform beds create a “floating” quality that allows the bed to look like it’s levitating. 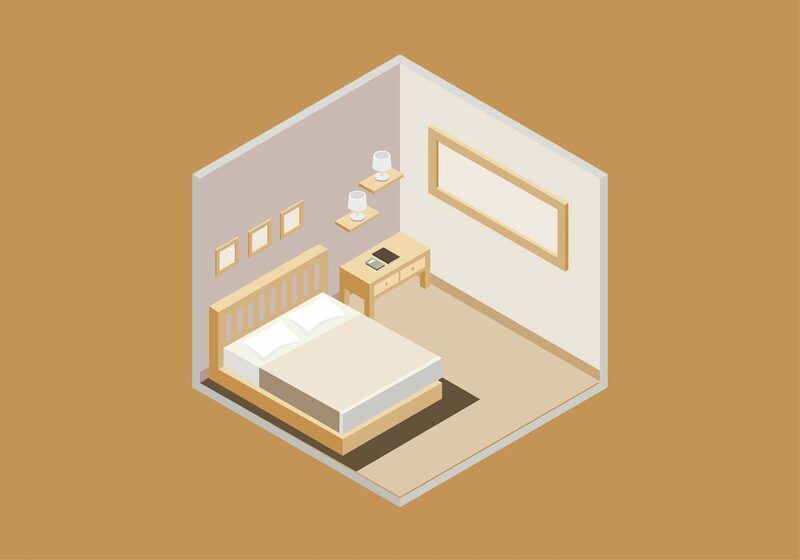 The result is creating a spacious environment in your bedroom. A Kakebuton may be understood as traditional Japanese quilt or other kinds of bedspreads that are used for bedding. They are very similar to the ones used in western countries. Two things that differentiate them are that they are made from hand-pulled silk, and tend to be minimalist in design. As a whole, a Japanese bedroom is one of the most beautiful indoor themes you could ever bring into your homes. If you are interested in an Asian home decorating idea for your own house, there are a few things that need to be done. The details given below explain just that, and are applicable whether you are decorating a new room or redesigning an existing one. The most important thing to focus on is the principle of simplicity elegance. 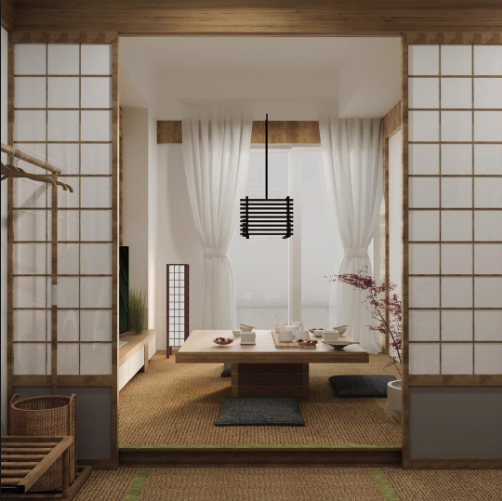 The traditional Japanese bedroom, along with their modernized adaptations, focuses on creating an environment of simplicity, modernity and comfort. What this means for you is that you will have to remove anything and everything that is ‘excess’. A minimalist approach towards room design will require you to create a place free of clutter, excess furniture, etc. The next thing to do for creating your Japanese bedroom theme is to find suitable furniture. All furnishings used in traditional Japanese rooms come with a low floor clearance. In many cases, there is almost no space between the furniture and the floor. And this is true for all furnishings; tables, chairs, beds, etc. In case you have furnishings with long legs and a high floor clearance, you will need to have them replaced with shorter ones. 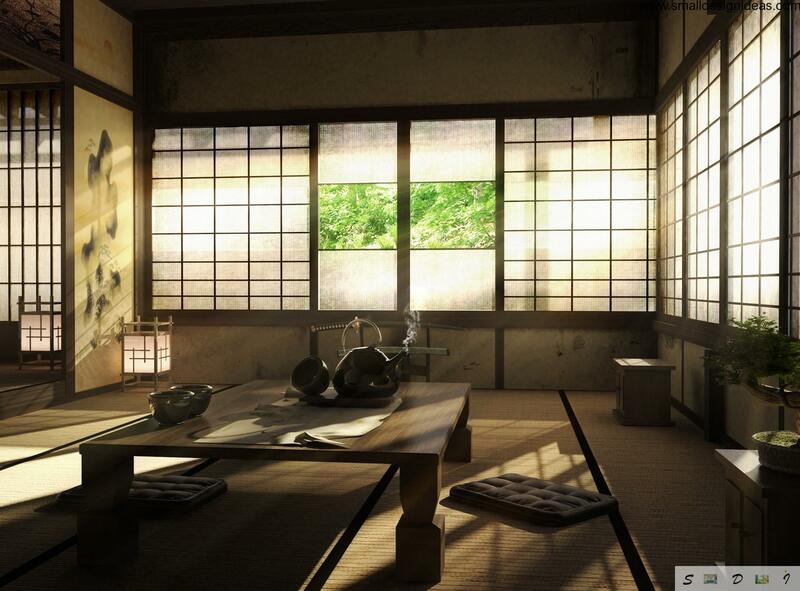 There are two kinds of screens that can be put up for a traditional Japanese bedroom theme. Your exact choice will depend on your limitations. If you are to remodel the house or make similar adjustments, you can go for the screens known as Shoji, which includes the sliding doors and windows. This can, however, be problematic if you aren’t living in your own home and will need the permission of the landlord. Another kind of screen that you can go for is the Byobu, which include the screens used for separating divisions within a room. These are a lot easier to place and come with little or no difficulty in placement. Do note here that Byobu screens are very delicate and need to be handled with care. One small mistake and you can damage the screens. Another thing to take into account is the decorations used in traditional Japanese bedrooms. The Japanese prefer rooms that have minimal decorations. This applies even to the decorations themselves, which are expected to have minimalist designs. The decorations that you can go for include paintings, bonsai, indoor bamboo, etc. The designs used may include animals, birds, Kanji, etc, all of which must be the sole subject of focus, without any ‘background’. There is another thing that you can take into consideration as well to get an authentic Japanese feel. These include the elements of scent, sound, lighting, and color used for the Japanese bedroom’s environment. With regard to the scent, try to get Japanese incense or for that matter any incense that doesn’t have a strong odor. The fragrance should be mild and pleasant to scent. As for the sound, try to make the room as sound-proof as possible, while eliminating any sources of unwanted sound that you possibly can. Coming to lighting, replace any bulbs or other sources of light with something a bit more down to earth and mild. Last but not least, check the color of the room and see if they are overly bright or colorful. Try to have them replaced with earthy colors that are mild and calming. Japan has undergone a lot of changes from its olden days. Compared to the first time Commodore Perry landed on Japanese shores, the country has undergone tremendous change. Affecting all aspect of Japanese life, the country has transformed in ways that are very hard to imagine. This is evident almost everywhere in Japan, both with homes and the larger country. In the case of home décor, one can observe the changes due to modernization as well. This is particularly evident in urbanized areas, where exposure to global lifestyles has started to change the way the Japanese people approach indoor décor. Regardless, the traditional forms of design are very efficient, even when the Japanese bedroom design is for small spaces. Paintings depicting traditional Japanese life, birds, Kanji, Haiku, etc. 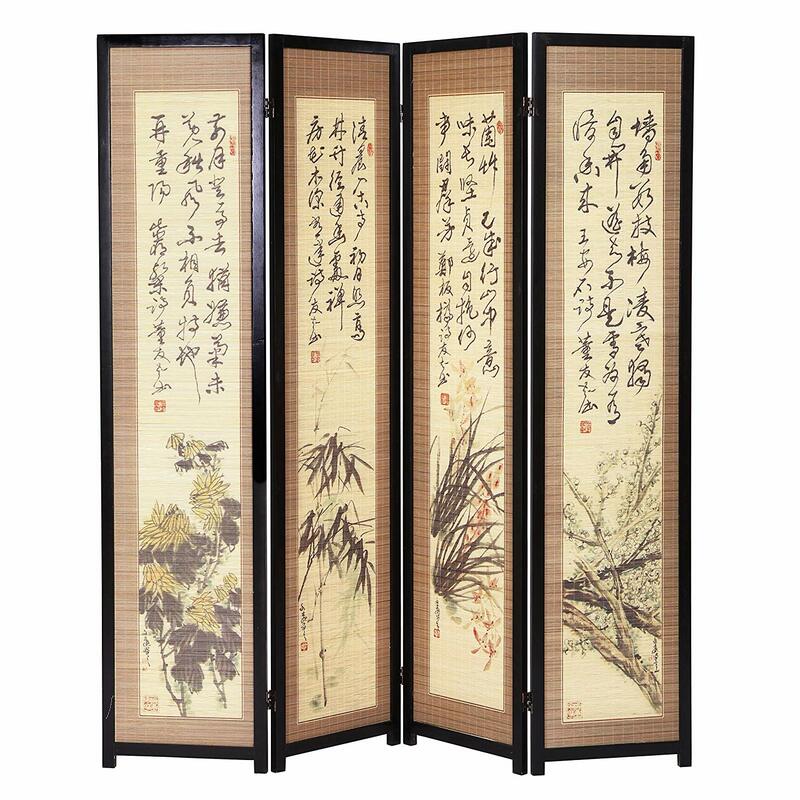 Screens with dragons, traditional Japanese paintings, Kanji, etc. Traditional Japanese bedroom furniture, which is characterized by a low height. Japanese bedroom decorations, such as Bonsai, Bamboo, etc. In simple words, the most popular traditionalist ideas of Japanese bedrooms are the same details mentioned in the previous points. When it comes to modern Japanese bedrooms, there is a clear shift from traditionalist approaches. For example, a modern Japanese style bedroom tends to have normal furnishings rather than those low to the floor. The sources of lighting may also vary as well. Read 5 Simple & Easy Ways To Add Japanese Home Decor To Your Bedroom to find more ideas on how to design and decorate your room with minimalist and beautiful decor. But the one thing that is very apparent even in urban Japan, where the modernization is evident, is the emphasis on minimalism. Even in modern Japan, people hold the principles of Minimalism in great regard and apply it diligently in every aspect of their life. So if you want to embrace the Japanese way in creating a modern interior, you could choose to have a minimalist approach in decorating your room. There are also the cultural elements of Japan that are found all over Japan, including urban areas. These include paintings, artworks, bonsai, etc. 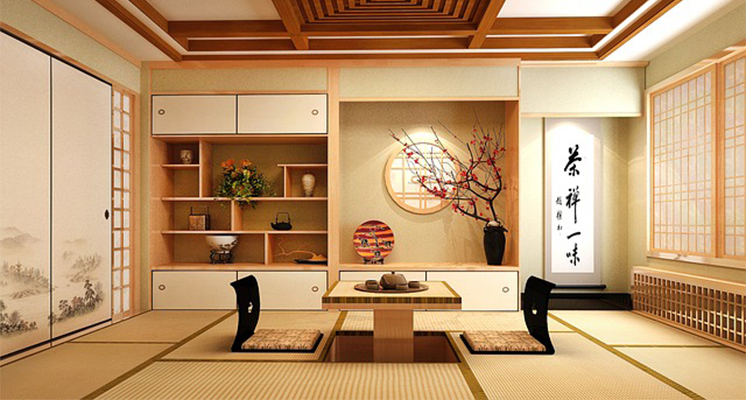 Feel free to do your own research and find out the element of Japanese décor that suits your room the best. In all, a traditional Japanese bedroom is one of the most appealing of all interior designs. With its emphasis on minimalism, simplicity and harmony with the self, it is one of the best designs you can go for. So if you are into creating a traditionalist Japanese bedroom, you should be having a good idea now, as to the elements that go into creating that unique Japanese feel and ambiance.